The flange design was evaluated through structural analysis considering different loading conditions. The stress and deformation generated due to vibrations were analyzed through modal analysis. 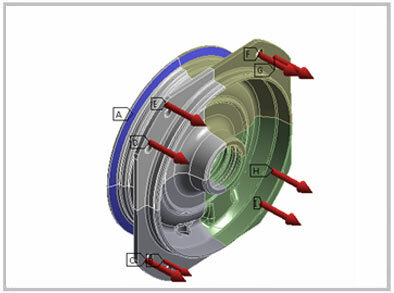 Through harmonic analysis, the flange design was evaluated for maximum possible loading conditions. The results showed an increase in stress levels for which a design modification was suggested. Spring brake actuator is an important element in parking or service brake mechanism. Its primary purpose is to impart force on the brakes to generate the braking effect. The flange however, is exposed to high braking force from one ends, while a spring force from the other. This causes the flange to develop excessive stresses and possible deformation. Moreover, there is also a significant impact of the vibration frequencies resulting from engine and road conditions, causing the component to deform even quicker. A prominent auto parts manufacturer from India was seeking a design solution, to overcome the pre-mature failure of the spring brake actuator through computer aided simulations. The flange utilized in spring brake actuator was successfully modeled to conduct structural analysis. 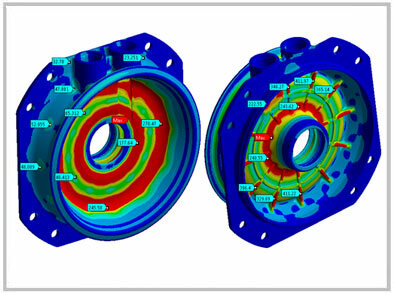 Three different cases were considered based on the magnitude of load applied on either side of the flange to record the stress and deformation values. Using modal analysis, the natural frequency of the flange was measured for different modes. Considering the mass and given vibration level, harmonic analysis was performed for the flange to identify vibrations across three directions. The direction excitation results showed that the stress levels exceeded the permissible range. In order to compensate the stress concentration across the flange geometry, a design modification was suggested by applying ribs radially.